Useful for cutting trees of various sizes and firewood, chainsaws make quick work of weekend yardwork. 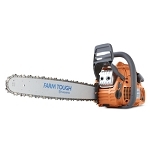 Our chainsaws have powerful motors to help you safely cut with ease. If you have any questions about our chainsaws, call us today to learn more!